I love beautiful things, but I also love a crochet project that is quick and easy to make, and that is exactly what this scarf is! It is soft and warm with plenty of gorgeous drape, and would be a perfect accessory to wear on a winter date night (Valentines is just around the corner, ladies)! The pattern gets it’s name from the color I used as well as the “twisting” motion of the design. You’ll need to know the basics–chain, slip stitch, single crochet and double crochet to crochet this scarf, which means even someone who is a beginner should get the hang of this pattern fairly quickly. I’ve made mine using Caron Simply Soft in a rich Autumn Red, but you are welcome to use any color of yarn you wish. Keep scrolling down for the free scarf pattern, but before you do, did you know there is a matching slouch hat for this pattern? There is, and it’s just as rich looking! Find the Cranberry Twist Slouch Hat over here, (it comes in 2 sizes–child and teen/adult, but is easily customizable for more sizes. And, if you’d prefer a bonnet style hat, find the original Cranberry Twist Slouchy Bonnet here. Gauge isn’t particularly important. Mine has approximately 4 of these repeats in 4“: (2dc, ch 2, sc) in same stitch, skip 3 stitches. You can make this as wide or narrow as you’d like. The beginning chain is 240 for a body that is about 6 ft long. 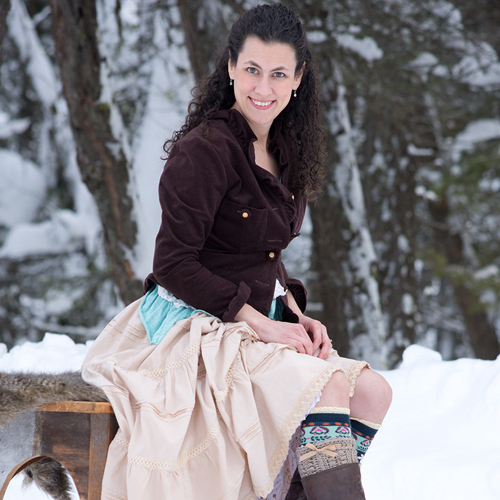 Add or subtract 40 stitches to grow or shrink this scarf by one foot. If you need more precise measurements, this pattern is written in multiples of 4. The starting chain divided by 4 should give you the number of “bumps” in a row. Repeat row 2 until your scarf is as wide as you’d like it (12 or 13 rows should get you to about 6”) then do the edging row. Edging/ending row: sl st into first ch-2 space, *ch 3, sl st into next ch-2 space* when you get to the end of the side, keep working around the corner and continue this pattern along end of scarf. End row 2: ch 1, turn and sc along the end in the chains you just made, ch 30, turn. End row 3: sc in first stitch, sc in each stitch across, at the end of the row ch 30, sl st back into the final sc, turn. sl st along stiches between rows 2 and 3, using relaxed tension. Attach yarn to other end of scarf, repeat ending steps across scarf end. 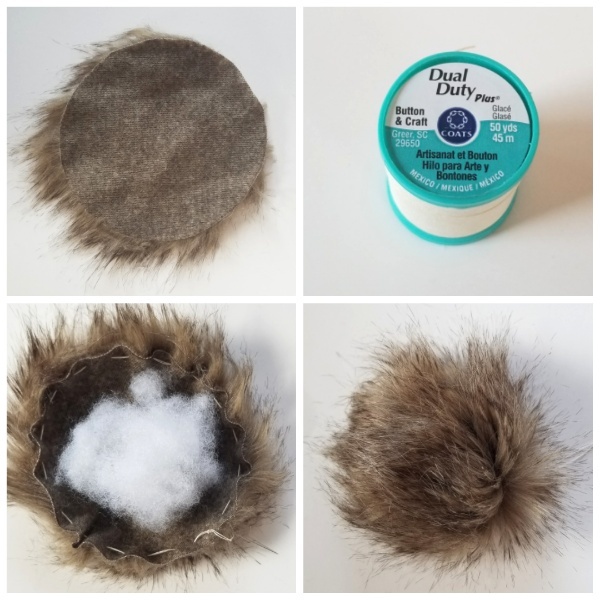 If you want to make fur pom-poms, here is a short tutorial that will show you how. If you prefer to make a yarn pom-pom, you can do so using a pom-pom maker. 1. Trace a circle around a small bowl or cup using a marker, on the back side of the fabric. My circle was 4″ across. 2. Cut out the circle. Only cut the fabric backing–not the fur itself! I recommend an Exact-o or similar craft knife. 4. Take a small amount of polyester stuffing and put it in the middle of the circle. 5. Tug on the ends of the thread to cinch the circle into a ball. It should be snug so the fiber fill doesn’t come out. 6. Tie off securely, and then sew the pom-pom to your beanie. Securely attach Pom-poms to ends of loops with the button thread. I love this scarf! The pom poms are really the icing on the cake! Just to clarify, in row two it says, “move to next ch-2 space [2 DC, ch 2 , sc] in next stitch.” Does “next stitch refer to the ch-2 space? Or am I supposed to be placing the 2 dc, ch 2, sc in the next stitch, which I think is a DC?